Managing to balance a course load of 20 hours, while also serving as a member of the Tigerette Danceline and a Cowley tutor, Cera Magana was recognized for her outstanding work by being named Cowley College’s December Student of the Month. The pre-pharmacy major is the daughter of Clay and Valarie Magana. She has a sister, Lara Rhamay 28. Grandparents are, Jesse and Diana Magana of Kanoplis, KS, and Howard Thiemer of Wichita. Magana graduated from Campus High School in Haysville, KS in 2014. At Campus, she was involved in dance, soccer, Spanish Club, Student Council, the National Honor Society, and an elementary tutoring program. 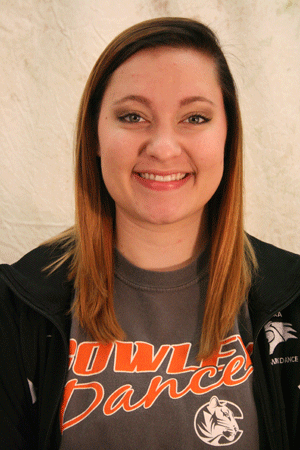 She chose to attend Cowley because it was close to home. However, since coming to Cowley she has found that the school is so much more. At Cowley she has posted a grade point average of 3.63. She was the recipient of an ACT Scholarship and was named to the Dean’s Honor Roll. “Cera is a great example of what we want to see in our Cowley students: a hard-working student, well-rounded, involved in activities, positive attitude, and speaks well of our college,” Humanities Department instructor Deb Layton said. Magana has volunteered her time to tutor fifth graders and helps out in Cowley College’s Human Resources and Endowment Office. In her free time she enjoys reading, being involved in her church, and spending time with friends and family. Magana was surprised and honored to be named Student of the Month. “My family was really proud of me which makes me happy,” Magana said. After graduating from Cowley she plans to attend either the Kansas University or Oklahoma University Pharmacy School with the hopes of one day doing pharmacy work for a Children’s Hospital.